The BNP nomination board on Monday gave strong messages to its nomination seekers to stay united and refrain from intra-party conflicts and violence as the party wants to return to power through a credible and peaceful general election. After facing the interview by the BNP nomination board, a number of aspirants said they were also instructed to get ready to resist any kind of vote fraud with their united efforts. The nomination board also asked the party hopefuls to work for the candidates of their alliance partners with the same spirit and provide them all-out cooperation in the greater interest of the party and have their chairperson Khaleda Zia freed from jail. The aspirants said they assured the board of staying away from infighting and working together with a formidable spirit so that all the candidates of the ‘Sheaf of Paddy’, the BNP’s election symbol, can come out successful. Iftekhar Alam Agni, a nomination seeker from Jashore 1, said they assured the party high-ups that they will not harm the party unity for their personal interest, and work for the victory of the ‘Sheaf of Paddy’ to take the party to power and free their chairperson Khaleda Zia. Syed Moazzem Hossain Alal, party joint secretary general and a spirant from Barishal-5, said Tarique told them that all the nomination seekers have more or less sacrifices for the party as well as contributions to it. “There’re many competent candidates. We’ve to select one in each constituency. We also have to share seats with our friends from our alliances. So, all must accept the party decision whatever it may be,” he quoted their acting chairman as telling them. Abu Naser Rahmat Ullah, also the nomination seeker from Barishal-5, said they were directed to remain united and work hard for the ‘Sheaf of Paddy instead of thinking about any person or candidate. Saidul Alam Milon, a nomination seeker from Bhola-3, said they assured their party high command that they will refrain from intra-party conflicts and violence and put in their best efforts to check vote rigging so that the party can win the polls. 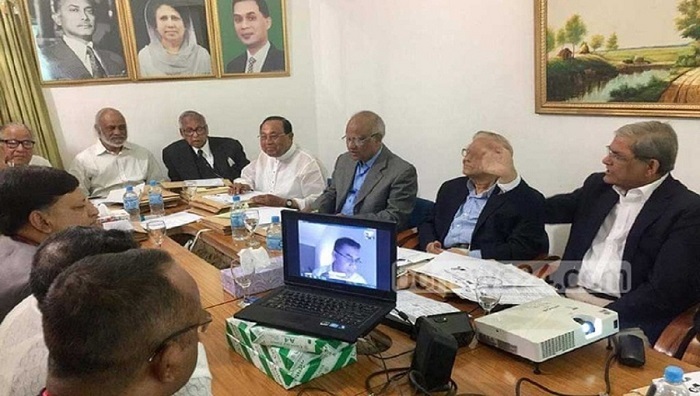 Despite objection from the ruling Awami League, BNP acting chairman Tarique Rahman joined the nomination board through videoconferencing and interviewed party nomination hopefuls for the second day on Monday. The party nomination board, comprising BNP standing committee members, started the interview with those who bought party nomination forms for Barishal division at BNP chairperson’s Gulshan office at 10 am. Later, they interviewed the aspirants under the Khulna division. BNP secretary general Fakhrul Islam Alamgir said they took the interviews of 183 nomination seekers of their party under Barishal division in the morning. He said they will consider the loyalty towards the party and devotion for democracy as the main criteria in selecting its candidates.